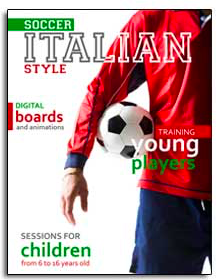 This educational app is fully interactive targets all youth divisions, teaching the newest Italian academy methodology and philosophy, brought by you by the Soccer Italian Style. For all divisions a complete mesocycle, created by professionals with long experience in the Italian academy, with technical, tactical and athletic objectives is presented. The majors’ innovations are its interactive degree and its content: there are about 300 exercises in the application which mimics game situations and can be promptly used in your training sessions, all of them illustrated and animated, making them easier to understand. This product a true excellence gem from Soccer Italian Style to all coaches that wish to learn about the top-notch Italian academy.